1. WHAT IS EMEDSTORE APP.? EMedStore is the India's first and most popular mobile app for pharmacy (medical store) to make online pharmacy within 24hrs. If you have a small pharmacy, EMedStore can help you create an online pharmacy app quickly and inexpensively. 2. WHY SHOULD I NEED EMEDSTORE APP.? EMedStore app can increase revenue, customer satisfaction, operational efficiency, customer engagement, visit frequency to your location, and can have many other benefits. The opportunities created by app for small pharmacies are valuable and extraordinarily cost-effective. In addition, mobile technology is growing very quickly, and is already overtaking desktop computing in many places. If you want to connect with your customers, mobile is fast-becoming the most popular channel available. 3. WHO CAN USE EMEDSTORE APP.? Any Pharmacist (Medical store owner)!. No special technical expertise is needed. We will walk you through each step of app training with our easy-to-use features. Once your app is published, you can evaluate, edit, and manage your app from your online pharmacy app dashboard with just a few clicks. 4. WHAT TYPES OF BENEFITS CAN I GET WITH EMEDSTORE APP.? Once upon a time, a mobile phone just made calls. Now, only the most basic mobile phones are call-only. Instead,modern smartphones are powerful mini-computers that can run programs called apps. When your pharmacy business puts out an app, customers can download it to their smartphone and interact with your health products business on the go. 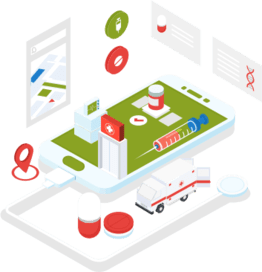 They can perform whatever functions you choose, from simple things to looking up offers, pharmacy details, send prescription, to more complicated things like submitting orders or sending a message to a pharmacist. 5. IF I MAKE AN ONLINE PHARMACY WITH EMEDSTORE APP, WHAT WILL THE APP BE ABLE TO DO.? We have a huge wealth of powerful features for you to incorporate into your app! You can view them all here. 6. HOW DO THESE FUNCTIONS HELP MY PHARMACY (MEDICAL STORE) BUSINESS.? Pharmacy app increase revenue. By making it easy for customers to contact your business, visit your location,hear about offers, and provide referrals, you can increase your revenue. Because app is mobile, your customers can do any of these things from any location, which makes your business more accessible than ever before. Mobile offers are redeemed at 10x the rate of print offers. EMedStore app increase customer satisfaction. Especially refill order, health products offers, chatting with pharmacist keep customers happy, which increases customer retention and referral rates which increase sales by 20% or more! It increases customer engagement. By making it easy to get in touch with your all clients and online business,you make it more likely that a customer will do orders. This can turn customers into brand promoters and helpboost revenue. Notifications have been found to lead to a 30% increase in customer engagement. 7. HOW CAN I GET EMEDSTORE.? Simple Call on +91 97377 12429 or send email on info@emedstore.in and our representative will get back to you shortly.